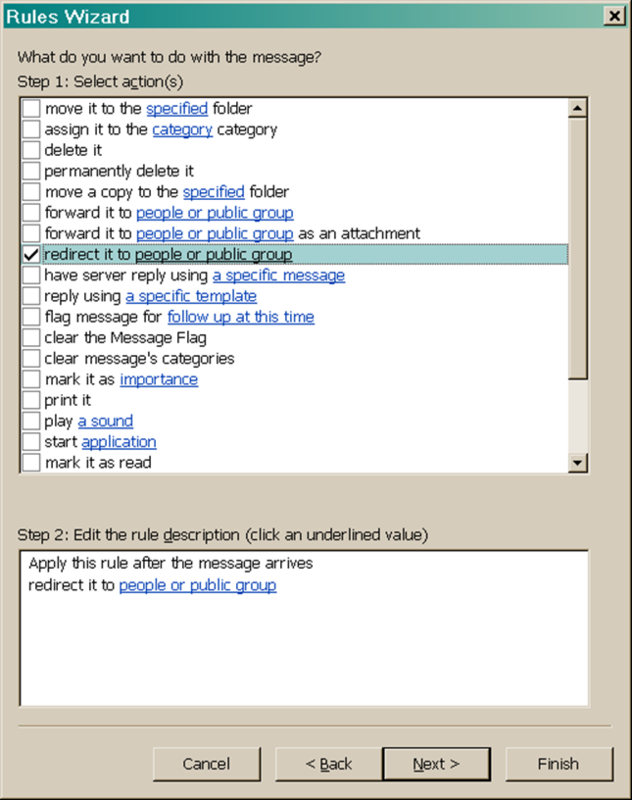 Instructions how to set forward from your Exchange Email account to other Email address. The example here is for forwarding to username@cs.technion.ac.il, but it can be to any other Email address. Please notice that it is called Email Redirect in Exchange. It will forward the message as is, with From and Subject untouched. It will also leave a copy in your Exchange Inbox. Exchange Forwarding rule is not Redirect rule. It will forward the message as you do manual forwarding, changing the From and Subject. Enter your Exchange from outlook. Select menu File, select Manage Rules & Alerts. Click Advanced Options… This will start the Rule Wizard. Click Next. Click Yes on “This rule will apply to very message you receive…”. Check “redirect it to people or public group”. If you don’t want to keep the messages in Exchange inbox, check also “delete it”. Click on “people or public group”, and enter the Email address to redirect (forward) to. 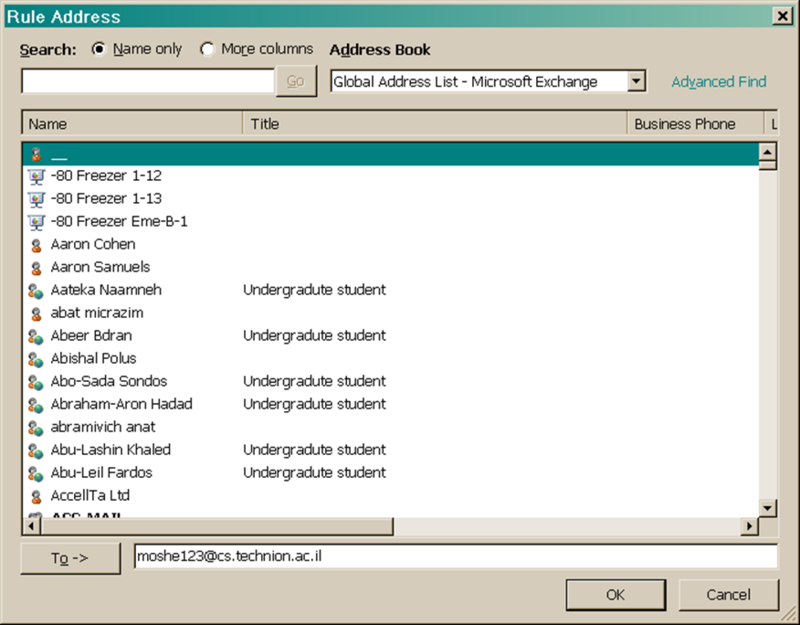 Example: moshe123@cs.technion.ac.il , and click OK. In Exceptions, click next (unless you want to set an exception). 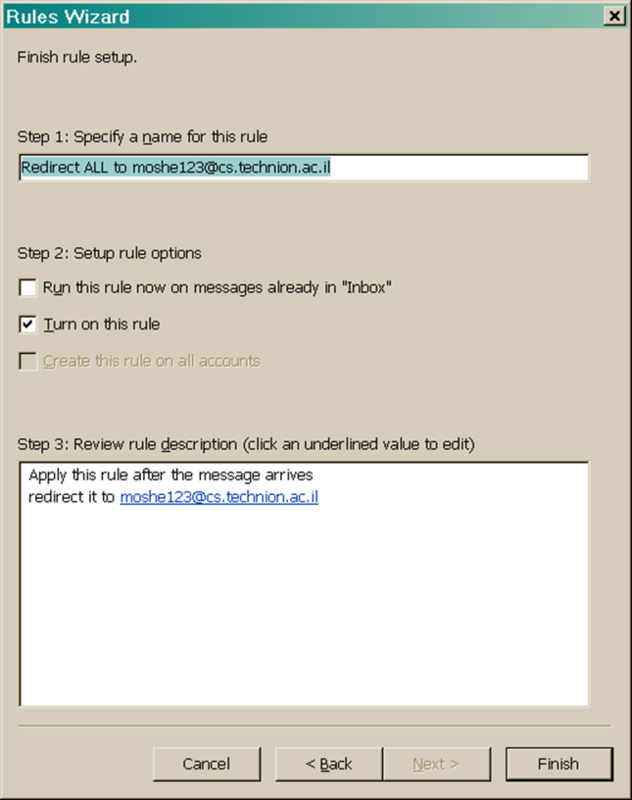 In Finish Rule setup, set the name of the rule to: “Redirect ALL to moshe123@cs.technion.ac.il“, or whatever you want. (change moshe123@cs.technion.ac.il to the Email you forward to), And click Finish. Now send mail to your Exchange address, and see if you get it in both Exchange and CS mail. You can always disable or change the rules in Rules -> Manage Rules menu. Login to Outlook Web App. Click Options > Create an Inbox Rule. If you click on “All Options..”, Inbox Rule in under Organize E-Mail . On the Inbox Rules tab, click New. Select the address you want your mail sent to by double-clicking on it in the address book view. If the address you want to redirect to doesn’t appear, you can enter the e-mail address in the To field.